(June 25, 2013) -- UTSA and The Winston School San Antonio (WSSA) have several things in common. They share school colors and both have a bird mascot. The new WSSA Eagle is the most recent connection between the schools. With help from Borst Marketing, WSSA recently completed a six-month re-branding project. David Morales, a UTSA senior majoring in art, played an integral part in the project. 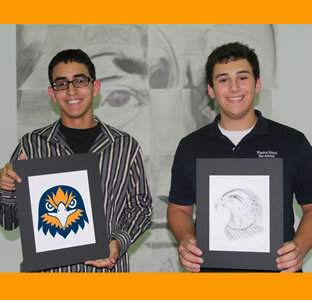 The process included a WSSA student competition to revamp the Eagle logo. Trent Trevino won first place in May. Elements of his and two other student creations can be found in Morales' graphic. Morales' design was unveiled at the June meeting of the WSSA trustees. Headmaster Charles J. Karulak said, "We were very excited about David's design for our new brand. It was exactly what we were looking for in a mascot and captured the creativity from our students." And, there are other school connections. Karulak was a founding advisory board member for teacher education in the UTSA College of Education and Human Development. Several WSSA graduates currently attend UTSA. "Several faculty and staff members, including myself, are UTSA alumni," said Lauren Walthour, WSSA director of advancement. "I was impressed by UTSA's recent rebranding success and am happy about this new connection between WSSA and UTSA. David tied a perfect bow on our package, and we are thankful for his talent. His father is a member of our advancement team and brought this project to David's attention."